This map shows the contiguous United States and in insets at the lower left, the two states that are not contiguous. The contiguous United States is the 48 adjoining U.S. states plus Washington, D.C. (federal district) on the continent of North America that are south of Canada and north of Mexico. The term excludes the non-contiguous states of Alaska and Hawaii and all off-shore United States territories and possessions, which include American Samoa, Guam, the Northern Mariana Islands, Puerto Rico, and the United States Virgin Islands. Together, the 48 contiguous states and Washington, D.C. occupy a combined area of 3,119,884.69 square miles (8,080,464.3 km2), which is 1.58% of the total surface area of the Earth. Of this area, 2,959,064.44 square miles (7,663,941.7 km2) is land, composing 83.65% of U.S. land area, which is very similar to the area of Australia. Officially, 160,820.25 square miles (416,522.5 km2) is water area, composing 62.66% of the nation's water area. The contiguous United States would be placed 5th in the list of countries and dependencies by area; the total area of the country, including Alaska and Hawaii, ranks fourth. Brazil is the only country that is larger than the contiguous United States, but smaller than the entire United States, while Russia, Canada, and China are the only three countries larger than both. The 2010 census population of this area was 306,675,006, comprising 99.33% of the nation's population, and a density of 103.639 inhabitants/sq mi (40.015/km2), compared to 87.264/sq mi (33.692/km2) for the nation as a whole. Because Alaska is also on the North American continent, the term continental United States, if interpreted literally, would also include that state, so the term is sometimes qualified with the explicit inclusion or exclusion of Alaska to resolve any ambiguity. The term was in use prior to the admission of Alaska and Hawaii as states of the United States and at that time usually excluded outlying territories of the United States. However, even before Alaska became a state, it was sometimes included within the "Continental U.S."
CONUS, a technical term used by the U.S. Department of Defense, General Services Administration, NOAA/National Weather Service, and others has been defined both as the continental United States, and as the 48 contiguous states. The District of Columbia is not always specifically mentioned as being part of CONUS. The term "Lower 48" may or may not include the District of Columbia, which is not part of any of the 48 states. However, common usage is that it includes D.C. and simply means the contiguous U.S. as a region, since there is no typical need to politically separate D.C. from the region in everyday speech. "Lower 48" is also ambiguously misleading, since all the major islands of Hawaii are farther south than the most southern point of any other state, and thus, Hawaii could be considered "lower" than any other state. The National Geographic style guide recommends the use of contiguous or conterminous United States instead of lower 48 when the 48 states are meant, unless used in the context of Alaska. Alaska became the 49th (and northernmost) state of the United States on January 3, 1959. Alaska is on the northwest end of the North American continent, but separated from the rest of the United States by the Canadian province of British Columbia. In Alaska, given the ambiguity surrounding the usage of continental, the term "continental United States" is almost unheard of when referring to the contiguous 48 states. Several other terms have been used over the years. The term Lower 48 was for many years, and still is, a common Alaskan equivalent for "contiguous United States". Some parts of the contiguous United States are accessible by road only by traveling on Canadian soil. Point Roberts, Washington; Elm Point, Minnesota; and the Northwest Angle in Minnesota are three such places. Alburgh, Vermont, is not directly connected by land, but is accessible by road via bridges from New York and Vermont. Washington, D.C. (the U.S. capital, also referred to as the District of Columbia) is not to be confused with the state of Washington. ^ "United Airlines website". Retrieved 2012-04-04. Contiguous United States: The 48 adjoining states and the District of Columbia. ^ a b Random House (1991). Random House Webster's College Dictionary. New York: Random House. "Military Bases in the Contiguous United States". National Park Service, U.S. Department of the Interior. Retrieved 2012-11-28. "Soil Moisture Regimes of the Contiguous United States". U.S. Department of Agriculture. Retrieved 2012-11-28. ^ "The Longest Line in America!". Retrieved 2013-10-15. ^ """HowStuffWorks "Geography of the United States - Geography. Geography.howstuffworks.com. 2008-03-30. Retrieved 2013-10-29. ^ "Resident Population Data - 2010 Census". United States Census Bureau. Retrieved 2011-01-30. "National Geographic Style Manual". Retrieved 2012-04-04. The continental United States comprises the 48 contiguous, or coterminous, states plus Alaska. "United Cargo website". Retrieved 2012-04-04. Continental United States: The 48 adjoining states, Alaska and District of Columbia. "Alaska Airlines website". Retrieved 2012-04-04. The Continental U.S. includes the lower 48 states as well as the State of Alaska, unless otherwise specified. ^ "U.S. Navy Style Guide". Retrieved 2012-04-04. CONUS - "Continental United States" CONUS refers to the 48 contiguous states. ^ *Internal Revenue Code. 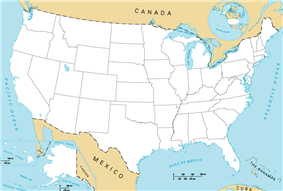 2007. the term "United States mainland" means the continental United States (not including Alaska). "... outside the continental United States (includes Alaska and Hawaii, as well as Canada and all foreign countries)... "Equimax candidate listing". Archived from the original on 2011-07-10. Retrieved 2012-11-28. ^ "National Geographic Style Manual: conterminous, or contiguous, continental, continental United States". Retrieved 2012-04-04. Use contiguous, or conterminous, for the 48 states. The continental United States comprises the 48 contiguous, or conterminous, states plus Alaska. ^ "National Geographic Style Manual: Alaska". Retrieved 2013-12-06. The continental United States includes Alaska. In Alaska context, lower forty-eight or lower 48 may be used. Do not hyphenate lower 48 as an adjective. The term outside may be put in quotes on first reference if ambiguous. To distinguish the 48 states from the 49 or 50, use contiguous or conterminous. ^ "ALASKA: State Profile". Archived from About Alaska the original on 2010-01-26. Retrieved 2013-12-06. ^ Ross, Oakland (June 3, 2011). "Orphans of the atlas". Toronto Star. Retrieved 2011-06-05.